Hello there! I love enjoying this soup with a grilled cheese sandwich; it’s one of my ultimate food pairings, but this soup is fantastic on its own. I like to have this as a light lunch, as a starter (appetizer), or as a side dish. It’s a comforting bowl of homemade tomato soup prepared in the Instant Pot. It’s so easy to make and has only nine ingredients. That includes the pantry staples such as oil, salt, and pepper! However, there are a couple of “secret” ingredients in the recipe that gives this soup amazing flavour! What’s in this soup recipe? Fresh tomatoes: I used on-the-vine ripe Roma tomatoes as they are tangy, thin-skinned, and have few seeds. Plus, they are commonly available in most grocery stores, but choose the type you like the most. You can also substitute with canned crushed or whole tomatoes if you like. Fresh tomatoes are in peak season during the summer, but they are available year-round. To peel or not to peel? I don’t. It’s much easier to not having to go through the process of peeling plus the tomatoes soften and puree smooth. Carrots and Onions: Carrots adds body (it helps thicken up the soup) and vegetable sweetness while onions sautéed with olive oil give a tasty, slightly caramelized, rich flavour that onions get when cooked in oil. Balsamic vinegar: It’s “secret” ingredient number one! This gets stirred into the browned onions. 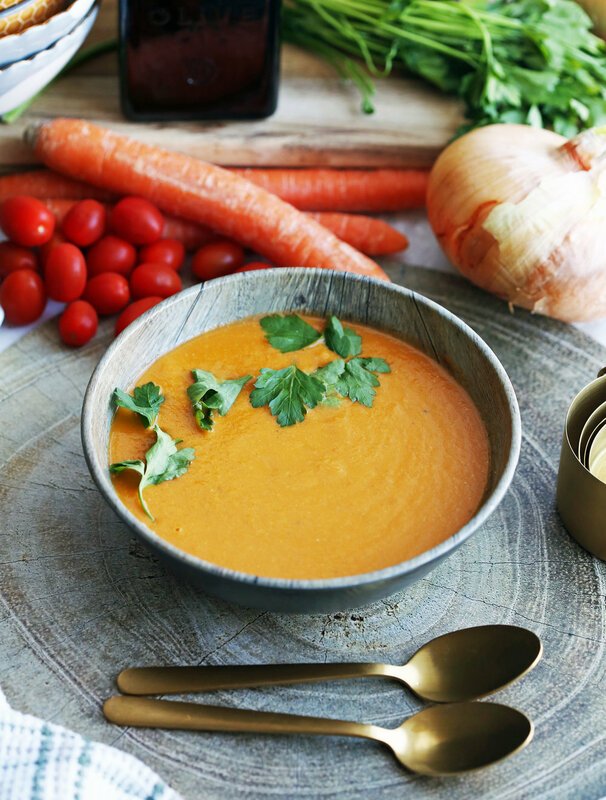 The sweet, tart, and tangy flavours of this vinegar complement the other ingredients in this recipe giving this soup a more robust flavour. It’s one of my favourite ingredients to use. Basil Pesto: It’s “secret” ingredient number two! This is another simple addition that gives the soup a big flavour boost. Traditional pesto contains a mix of Genovese basil (very aromatic), garlic (slight pungent sweet notes when cooked), cheese like Parmigiano Reggiano or pecorino romano (yum! ), pine nuts (adds buttery nutty notes), olive oil, and salt. All ingredients that match perfectly with tomatoes. If you want to make this recipe vegan, look for pesto that is free from cheese. Vegetable broth (or stock): The base of this soup. You can also substitute with chicken broth (or stock) if you prefer. Salt and pepper: So important. These two ingredients enhance all the other ingredients. How to make this tomato soup? 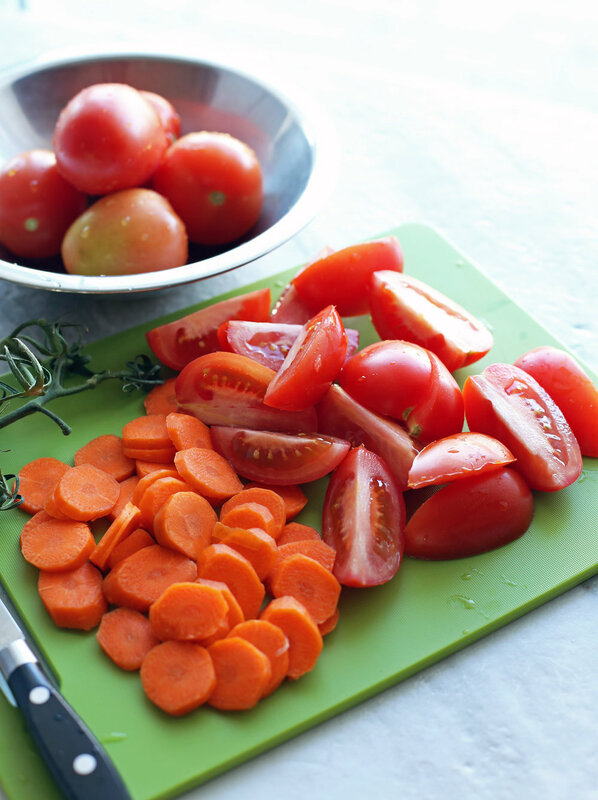 Prepare your ingredients such as chopping up your tomatoes and carrots first. Full ingredient amounts and ingredients available in the recipe card down below. Sauté sliced onions in olive oil until browned and then mix in balsamic vinegar. Add in the remaining ingredients and then give the soup a stir. This is what it looks like after everything is cooked. Only 5 minutes cooked at high pressure and 10 minutes of natural release. Blend until creamy and smooth. I love using an immersion blender (hand blender) so you can whip it up right in the Instant Pot, but you can also use a blender. Just be careful to not overfill the container or it may splatter. Looking for more Instant Pot soup recipes? Here’s four more. Comforting, healthy, and delicious: Fantastic fresh tomato flavour! Full of sweet, tangy, and salty notes. Low on the amount of ingredients used: Only nine ingredients in total and that includes oil, salt, and pepper. Plentiful as it makes a good amount of soup: This recipe makes between 5 and 6 cups! Lovely to serve as an appetizer, side dish, or a light meal. Set the Instant Pot to "sauté". Add the olive oil and onion to the pot, stirring until it browns, about 5-6 minutes. Then stir in the balsamic vinegar for another 1-2 minutes. Press “cancel” to turn off the Instant Pot. Add the remaining ingredients: tomatoes, carrots, pesto, and vegetable broth to the pot. Season with a generous amount of salt and pepper. Give the mixture a good stir to distribute the ingredients. Seal the Instant Pot and cook at high pressure (“manual”/"pressure cook" function) for 5 minutes *(see first note). After it is ready, allow natural pressure release for 10 minutes before applying a quick pressure release to completely depressurize (until floating valve drops). Open the Instant Pot and give the soup a stir *(see second note). Using an immersion blender or high-powered blender **(see third note), blend the soup until smooth. *It takes the Instant Pot around 15-20 minutes to come to pressure (before the timer counts down). **If you find that there is too much liquid in the pot, carefully ladle out excess liquid before blending. You can always add it back in to thin out the soup if needed. ***If you are using a blender, blend in small batches. Careful as the soup is hot, and it may splatter. Makes 5-6 cups. Nutritional information represent one serving with six servings total.